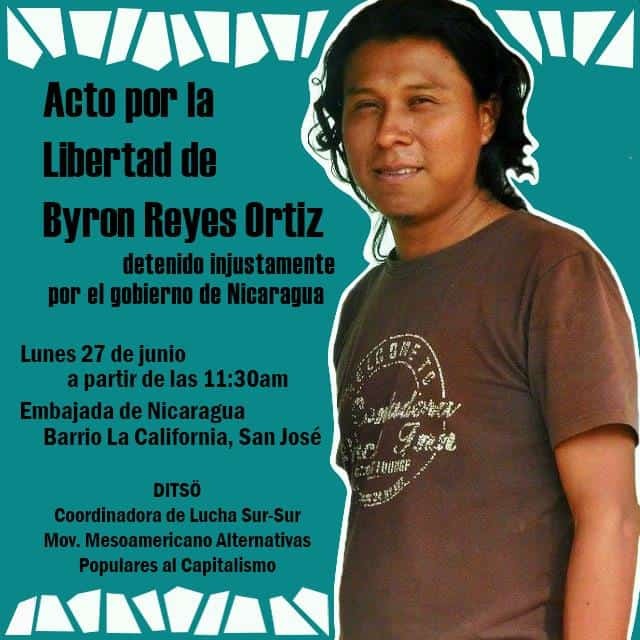 UPDATE: Monday, June 27, 9:00 p.m.
Nicaraguan authorities deported Costa Rican environmental and indigenous activist Byron Reyes Ortiz on Monday evening, two days after he was detained along with five colleagues for allegedly handling explosives. No charges were filed against Reyes, Costa Rica’s Foreign Ministry reported. The Costa Rican indigenous rights network Ditsö reported on its Facebook page that the other five foreigners who were detained with Reyes had also been released from custody, but that information could not be immediately confirmed. Costa Rica’s Foreign Ministry demanded information Monday about a Costa Rican man detained by Nicaragua’s National Police for alleged possession of illegal explosives. Nicaraguan police accuse the man, indigenous activist Byron Reyes Ortiz, along with five other foreigners of “handling explosive substances” during a workshop on Saturday morning in the town of Nueva Guinea, in the South Caribbean Autonomous Region. A 25-year-old man was injured, prompting the police response, according to a news release from the National Police. The police noted that the house where the explosion took place belongs to Francisca Ramírez Torres, a local activist opposed to Nicaragua’s plans to build a trans-oceanic canal. The implication could be that they were planning some sort of violent protest. But the groups supporting the six detained foreigners say they were actually doing a demonstration on environmentally-friendly cooking stoves and had a minor accident. Besides Reyes, Nicaraguan police detained Daniel Giménez Cacho from Spain, Ana Laura Rodríguez from Argentina, and Eugenio Paccelli Chávez Macedo, Salvador Tenorio Pérez and Emmanuel de la Luz Ruiz from Mexico. Police also arrested four Nicaraguan nationals, including Ramírez, but they were released Sunday, according to Nicaraguan daily La Prensa. The foreigners were transferred to Managua. Costa Rica’s Foreign Vice Minister Alejandro Solano said Monday that Costa Rican officials had not received information from Nicaragua as to Reyes’ exact whereabouts, legal status and health, in possible violation of the Vienna Convention on Diplomatic Relations. The indigenous rights coalition Ditsö, of which Reyes is a member, sent a letter to Nicaraguan President Daniel Ortega demanding the detainees be released “as they were arrested under false charges.” The group wrote that there was no explosion, as reported by the police, and that testimonies from local residents confirm that the police statement is false. “We are seriously concerned that hasty statements by President Daniel Ortega and the National Police aim to link these young environmentalists and our organization with an alleged use of explosive substances, which is completely false,” Ramírez said. Ramírez and other activists protested Monday outside El Chipote prison in Managua while Costa Rican supporters protested in front of the Nicaraguan Embassy in San José. The workshop at which the six foreigners were detained on Saturday was part of a Central American tour organized by pro-environment, pro-indigenous activists called the “Caravana Mesoamericana para el Buen Vivir,” or the Meso-American Caravan for Good Living. The caravan has been traveling throughout the region since last July, meeting with indigenous and campesino groups and holding workshops on green technologies. If Reyes and the other foreigners were detained for their link to anti-canal activists, it wouldn’t be the first time. In 2015, at least five foreign journalists working on stories about the planned trans-oceanic canal were detained by police in Nicaragua, including a reporter for The Tico Times. Environmentalists, local landowners and indigenous groups have clashed repeatedly with the government over the canal project, which opponents say was planned without conducting full environmental impact studies and without consulting the thousands of individuals whose land will be inundated by the project. The planned 276-kilometer-long canal was granted in a private bid to Chinese corporation HKND Group. The company broke ground on the project in 2014 but little progress has been shown since.